It was a great time out at the 2016 Yuma Home and Garden Show this year! 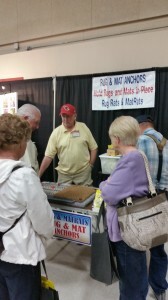 Had many new customers each day and also many that had already purchased my Rug Anchors the previous year and stop by just to tell my how much they loved my product and how well it worked for them. It was fun and can’t wait for next year!